Many Democratic caucus goers are dismissive of former U.S. Senator Jim Webb’s chances in the Feb. 1 Iowa caucuses. The recent Quinnipiac University poll shows 84 percent of registered Iowa voters haven’t heard of him, while the same numbers for his competitors are Clinton 9%; Sanders 39%; O’Malley 82%; Chafee 87%. “Webb also proved himself a serious person,” said John Deeth of Webb’s performance at the cattle call o’candidates the Hall of Fame Celebration had become. Webb had his chance to make a first impression. While this author is a natural Iowa constituent of Jim Webb, Webb’s hesitancy to act on climate, support the UN approved agreement that blocks Iran’s path to a nuclear weapon, and service in the Reagan administration are all problematic for different reasons. I’m not making anything of it, I’m just sayin’ he’s not playing caucus the expected Iowa way. At the same time, I believe Webb’s stock is on the rise after the Hall of Fame celebration and here’s why. 1. The IDP should blow up the coordinated campaign, as I have written previously. Whether that’s possible, I’m not sure, but Webb’s true maverick stance indicates if anyone can do it, he has a chance. 2. He turned down an opportunity to speak at cattle call #2, the Aug. 4 Iowa Democratic Wing Ding, which is currently sold out. Coupled with the idea that he has to win some of the four early states, Webb will be pressed for time. One more appearance at a multi-candidate event in front of party regulars would have diminishing returns. Especially since the first cattle call is on C-SPAN, available for viewing as people decide for whom to caucus. 3. If Deeth’s characterization is accurate, Webb must have a plan to turn out his voters caucus night. Not much public evidence of a plan today, but there must be one if he’s serious and I think he is. There is a flight from partisan politics and a focus on getting things done in the community. This is reflected in the fact that the largest registered voter block is No Party (705,658), followed by Republicans (609,020) and Democrats (584,737), according to June numbers from the Iowa Secretary of State. As 2008 unforgettably demonstrated, a key tactic to winning the caucus is turning out your voters and making sure as many as possible are people who don’t usually caucus. With same day registration, any eligible voter can turn up and participate. It’s going to take more than Joe Stanley’s happy face to develop and execute a Webb ground game. Given the fact he’s still in the race after lengthy deliberations, he may be better served keeping the strategy and tactics of this to his small circle of trusted advisers who have been with him for many years. In political campaigns, there is little reason to do what the other folks do, and that Webb sets his own direction has been his hallmark. 4. Webb is an experienced, disciplined tactician. When George Allen stumbled, Webb seized the opportunity and won election to the U.S. Senate from Virginia. The same Quinnipiac poll that showed Webb unknown to most Iowans, showed Democrats very beatable by some of the Republican field. It is way too early for polls to mean much, but the media picture and polling is not always what matters 6+ months from the caucus. That Webb has proven able to seize opportunity in a developing ground situation, and make the most of it, provides his campaign something Clinton’s massive campaign staff and Sanders’ tent revival congregation seem much less likely to be able to do: pivot on a dime. In my experience in campaigns, this skill matters a lot, and can be a deciding factor as it was in the Virginia senate race. 5. Finally, Webb’s veteran status matters. So many years after the fall of Saigon, I believe Webb and people like him did their best in a bad situation. At the same time, they pursued the war, fought its battles and are culpable. Maybe if we had read more stories about company grade officers like Jim Webb instead of William Calley public opinion about Vietnam would be different. The public view of veterans has changed. Regardless what one thinks of our endless wars, the politicians who promote them, and the soldiers who fight, get wounded and die in them, battlefield valor is something rare and recognizable. 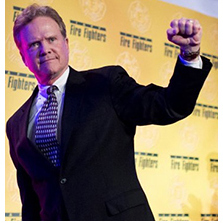 No question Jim Webb has it and lives a life of principle. The more people learn about him, they will see this characteristic, and maybe get off their duff on caucus night and stand for him. There is more hope of that today than there was a week ago.